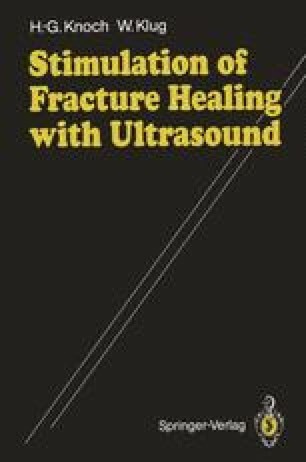 In evaluating the degree of acceleration of bone repair with ultrasound, we base our assessments on statistically established norms for fracture healing. These mean values are derived from clinical experience and from data in the literature. Also, we initially formed control groups of 200 patients for each type of fracture, administering conventional treatment to half the patients in each group and ultrasound treatment to the other half. This provided us with 2 groups of 100 patients each in which the results of conventional and ultrasound therapy could be compared. For less common fracture types, the groups consisted of 50 patients each. In recent years we have ceased to conduct this type of comparison, because our success rates with ultrasound have been so high that the modality has become an established part of our treatment protocol in all cases except those noted previously.